If you were a girl in the ‘tween age range in 1976, then you not only knew who 14-year-old Andrea McArdle was, you most likely worshipped and wanted to be her. We did—wishing we could belt out tunes like “Tomorrow” and “Maybe” from the Annie soundtrack just like she did. But after almost six years of being abused by Miss Hannigan, Andrea’s little orphan Annie grew up and hung up her red curly wig and dress. McArdle has returned to the Great White Way several times since Annie—starring in shows like Les Misérables, Beauty and the Beast, and, most recently, the 2006 production of The Best Little Whorehouse in Texas. But she’s never seen the success that she enjoyed in that very first show playing the lovable parentless little girl. Who knows if she’s trying to recapture that spirit or just wants her own shot at torturing the adorable urchins in the orphanage. Either way, McArdle has signed on to play Miss Hannigan in the North Carolina Theatre’s production of the show that made her a star. Andrea was on The Today Show yesterday talking about the pressure of playing the villain against a fresh faced actress in her iconic role. A daunting task but based on the footage, McArdle delivers once again. Just wait until you see the video—she’s barely aged a bit in the last 34 years. She even sings “Tomorrow” in the new production. 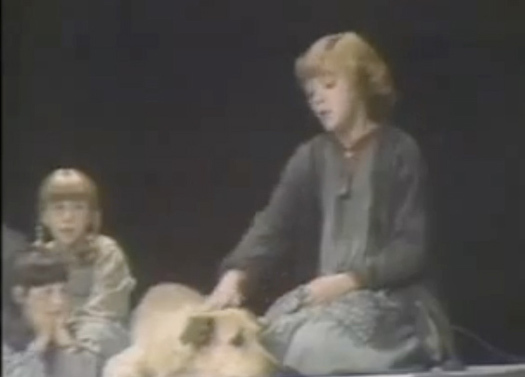 We defy any real Annie fans not to get chills. Diehards who want to make the journey can visit the theater’s website for tickets and the rest of you will have to settle for snippets shown during the Today Show interview.